A zoo is refusing to give up hope even though the search for a stolen baby penguin has so far proved fruitless. Three-month-old Toga has not been seen since vanishing from Amazon World on the Isle of Wight more than a week ago. After a tip-off that the rare bird had been dumped in Portsmouth docks in a plastic bag, a search of the harbour failed to turn up anything. Meanwhile, parents Oscar and Kyala appear to be preparing to lay more eggs, says the zoo. The couple were showing signs of nesting and had begun 'courting', said manager Kath Bright. She added that zoo staff were still following up all leads over Toga's disappearence and were determined to find out what happened. "I don't think we will give up. We will follow up every phone call we get - which is what we have been doing over Christmas," she said. The zoo has offered a £1,000 reward - with more than £2,000 more from donations - for the return of Toga, who they said would die without its mother. Toga lives on a special diet, needs to be kept cool with access to plenty of fresh water, and will not take food from humans. It is thought thieves may have scaled a 6ft (1.8m) outer wall at Amazon World, before clambering over an 8ft (2.4m) metal and concrete barrier to steal Toga. 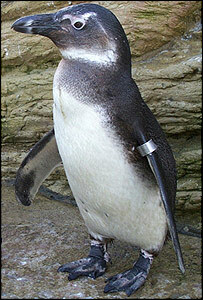 Toga was the first South African Jackass Penguin to be bred at the island zoo. There are now only six adults left there, including Toga's parents. There are about 150 to 200 of the rare and endangered breed in the UK.